We love helping bring your events to life! All props are typically rented on a 3-day rental. If props are needed for longer than a three day period, custom rental rates will apply. Each rental will require a signed rental agreement and a safety/security deposit which is refundable upon returning all of the props rented in good condition and in a timely fashion. To reserve a prop/props for a specific date requires a non-refundable rental deposit (which will be applied towards the rental price at the time of the prop rental). Pricing for each prop are based upon a "single item rental". Discounts may be given for renting multiple props for a single event. Don't see what you are looking for? We are happy to create custom props to meet your needs. Please contact the rental department directly to inquire about individual prop rentals, multiple prop discount rentals, prop sales, or custom prop fabrication. _This enormous colorful, front-faced human replica skull is sure to add the perfect touch to any environment! 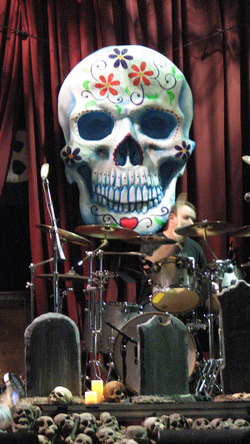 As seen at the House of Blues Anaheim and at the Rose Hills Dia de los Muertos celebration. This giant sized "Sugar Skull" prop was carved in Bas-relief style from white "bead" foam, mounted to plywood, sealed with "Poly-Gem" urethane hard coating, painted in bright acrylic paint with florescent and pearl accents, and then topped with a durable urethane clear coat. 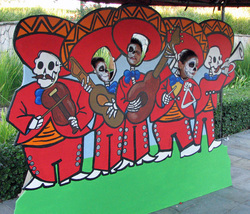 This particular skull features colors, styles, and motifs depicted in traditional “Dia de los Muertos” artwork. 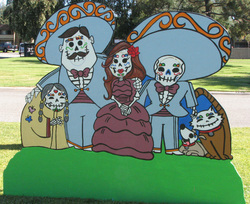 “Day of the Dead” art is used on that holiday to honor deceased family, friends, and loved ones. I had an absolute blast decorating this iridescent "Black Light" friendly prop in this whimsical and energetic style … I hope it makes you smile! It is approximately 4' tall x 3 1/2' wide x 6 inches thick. It is designed to easily and securely mount to a 4" x 4" pole. Please contact us directly for more information, availability, and to reserve this prop for your event. (1) available. 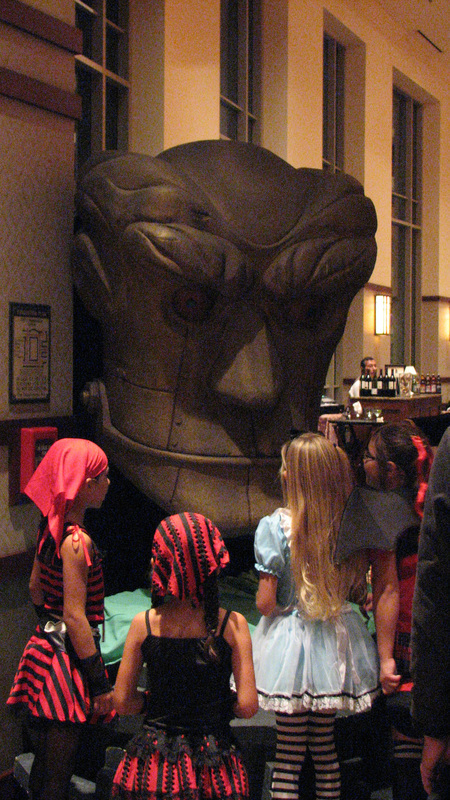 __This prop is an interactive, puppeteer-able item. The Head is carved from bead foam and mounted to a wooden structure. It has been painted white light-black light, appearing as antiqued metal in white light and with glowing eyes and mouth in black light. It features a moveable lower mandible and is plumbed for a fog/smoke machine which pushes the smoke out of the mouth. Rental price includes the Big Head prop, fog machine, fog fluid, and battery operated megaphone. We can provide an additional quote if you would like us to provide an actor/puppeteer for this prop. _This rental item is a static Skeleton nearly 10' tall when standing. Typically displayed seated upon a rustic throne, this rental includes the skeleton, crown, costume, throne, and scepter. _These rustic fences are ideal for theming and to create pathways, barriers, or partitions. Each cemetery fence is 8" and approximately 5' tall. Rental includes Fence, Cement Footings, and flickering lanterns. Price listed is for a 3-Day Rental for (1) fence segment. _This rental is for multiple props for a cemetery scene. 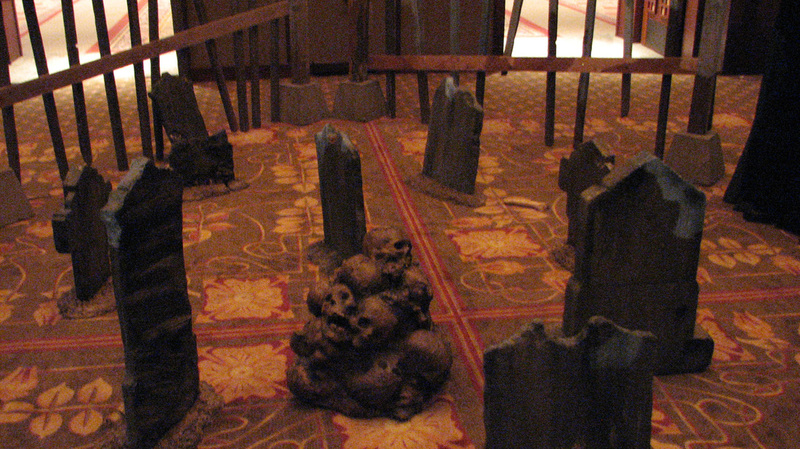 This set includes and assortment of (10) free standing Tombstones with bases and (2) skull piles. Rental Agreement and deposit required. Please contact us directly for more information, availability, and to reserve these props for your event. _This is a two prop set. 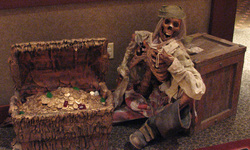 Includes Skeleton Pirate prop with wooden crate and large Golden treasure chest with coin and gem pile. 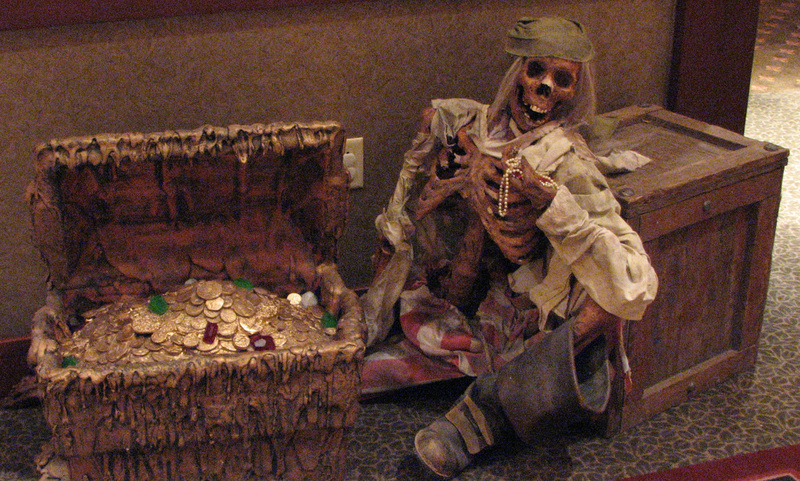 This rental item includes a background set piece, "curio" props, and an interactive smoking cauldron with light effects. 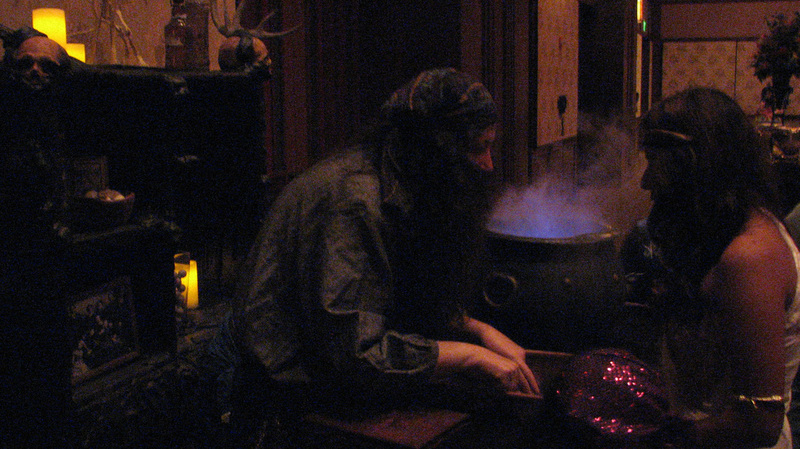 The cauldron uses a water atomizer unit that provides changing light effects and creates a water based "fog" mist. We can provide an additional quote if you would like us to provide an actor/puppeteer for this prop. 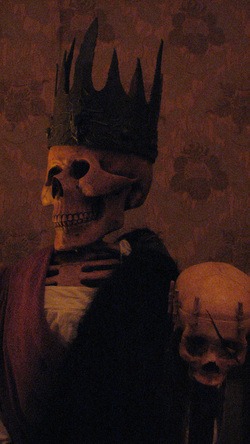 _This rental includes one Catrina prop with costume, hat, and fan. She is life-sized and makes an excellent photo op. The Catrina prop features urethane coated bead foam head and hands with with a wood stand. This is life sized static prop. 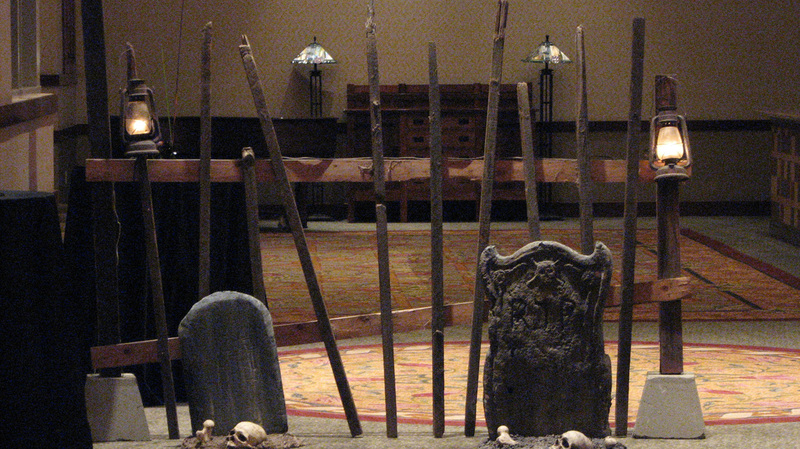 Includes a caged Vampire Skeleton corpse prop atop a themed wooden base. Additional vines are optional. This whimsical photo-op prop is a painted wood flat with doors that can be opened and/or closed to accommodate up to five (5) people to participate per photo. . This whimsical photo-op prop is a painted wood flat with doors that can be opened and/or closed to accommodate up to four (4) people to participate per photo. .